We’re on the Skagi Peninsula now and internet access is a little more random. We started field work on Rob’s and Adam’s projects this week. Rob found some awesome zeolites – too many to name – and a lot of altered basalt (my poor babies!). 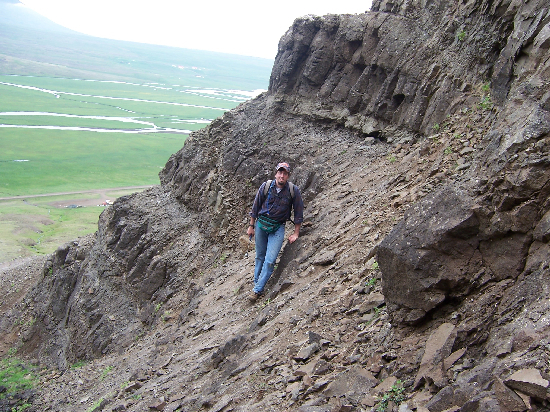 Adam ran into some trouble early on because many of the rhyolites appear highly altered, but has managed to find some pretty decent samples that he can use for geochemical analyses. 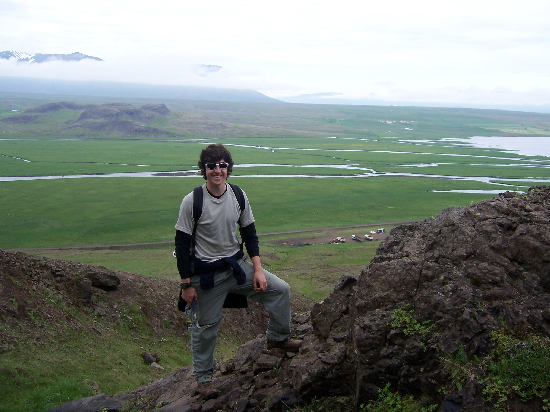 Rob poses while searching for zeolites in sunny Iceland (ha ha Estonia Group). Adam conquers Vatnsdalsfjall on his way to the top to sample rhyolites. We’re living in a house with 12 people – sounds like a reality show (The Geology World or Big Brother: Geo-Style). Meagen is in a room with 4 girls – it looks like their clothes exploded. Todd, Rob, and Adam are sharing a room – it smells…refreshing(?). They have swum in the arctic ocean EVERY DAY since we arrived. They are CRAZY! We’re going to be here until July 14. Sadly, we’ll be missing the Hunavaka, a local celebration with colorful balloons and music. Still, every day is a celebration when you’re doing geology!